Last year two of Florida’s finest craft representatives were invited to the Oregon Brewer’s festival. Dunedin Brewery (Dunedin, FL) was the only brewery from the state of Florida to be invited. So instead taking the easy route of shipping the beer and flying out to the far West edge of the country they decided to load up their refrigerated truck and hand deliver their kegs. Trace Caley (head brewer) and Mike Bryant (general manager) took a 14 day road trip while traveling 7,000+ miles while stopping at fellows breweries along the way. The trip was a huge success and Dunedin was the first booth in the whole fest to drain their kegs. Now, one year later the Oregon Brewers Fest once again asked Dunedin to represent Florida. This year they are expanding the tour to take a longer trip and make more stops. With the second edition of The Great Fl-Oregon Trail kicking off this week (July 12th to be exact) I asked Mike some questions about their beer travels. TRP: How did the first Great Fl-Or Trail come about? Mike: The first Oregon Brewers Festival I went to was in 2006, joining Trace Caley and 7 others on a road trip from Portland, OR to San Francisco, CA. From that time on, the journey to Portland & driving down the Northwest coast became an annual trip for me. In fact, I moved to Olympia, WA for college during those years. Bothe Olympia & Portland are very special cities for me. When Dunedin Brewery was invited to the 25th Annual Oregon Brewers Festival in 2012, the idea of a road-trip was natural. Rather than having 18 kegs shipped across the country on freight & flying out to meet them, we decided the opportunity was there for us to enjoy a few weeks on the road doing something we hadn’t heard of before: a Summer tour with beer. 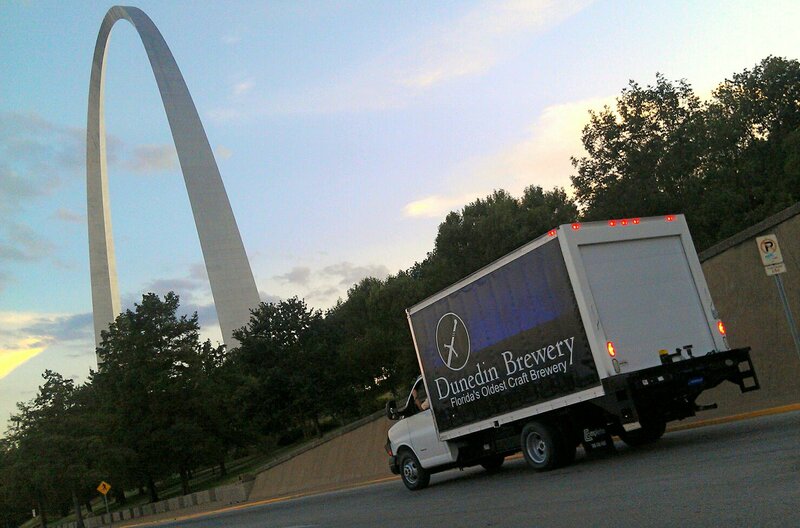 We would not only hand-deliver our product, but we would visit numerous breweries across the country & make new friends along the way. TRP: Why did you decide to road trip to the Oregon Brewers Fest last year? Mike: When opportunity knocks, open the door wide. At Dunedin Brewery, we enjoy taking things to a new level. Creativity allows us to explore the world rather than do things traditionally. When we were invited to the OBF last year, it was an opportunity for an adventure. I wasn’t sure who else would go for the idea, but it caught on rather well & this year our cross-country crew has more than doubled, not to mention those flying out to Portland just to show their support & kick it with us in the City of Roses. TRP: What were the other travel options? Mike: We could have freighted the beer via a trucking service & taken a plane out to Portland for the fest. This just didn’t seem to sound as fun as the road trip. TRP: What are the specs on your refer truck? Mike: The refrigerated truck is a GMC converted to a reefer in North Georgia. It seats two & carries up to 35 1/2bbl kegs. Across the sides of the truck is our flag. TRP: How many breweries did you visit on your trip last year? Mike: Over 30 breweries & brew pubs. TRP: How many states did you cross? TRP: What surprised you about the country as you crossed all those states? Mike: I’ve made this trip across the nation a few times, but I am always surprised by the vast subtleties in the landscape. The landscape continuously changes when you’re driving across the country. When you stay in one place for a few days, you can pick up on the patterns of your surrounding & maybe a few landmarks. But when you continue to move at 70+mph, the familiarity is lost. Instead, if forces one to reflect on the vastness of the country we live in. It’s huge. And every place you go is different. What’s common everywhere is good people. TRP: What was one memorable experience from the trip? Mike: Return Collaboration w/ Fort George Brewery. We spent a few days in Astoria with our friends at Fort George Brewery & Public House. Not only did we brew a beer called “Astoria on the Rock” with them in Astoria–we also shared meals, played disc golf & got to know our Northwest friends a little better. Nothing beats connecting with like-minded people & hitting it off naturally. TRP: What would you / will you do different this year? Mike: This year we are taking nearly 2 more weeks to tour around the country, hitting even more destinations across the nation. We are also seeking out talented people across the nation, asking them “What’s Your Craft?”, all while logging our findings via facebook & instagram using the hashtag #whatsyourcraft. This just gives us more ways to share our experiences along the Trail & allows others to participate in their own explorations. The 2013 version of the Great FLOregon Trial. TRP: What are you looking forward to on this year’s version of the trip? Mike: Most of all, I’m looking forward to seeing all my friends across the country. Just as equally, I’m looking forward to making many new friends along the way. Be sure to follow Dunedin’s journey to Oregon Brewers Fest. Who knows you just might run into them down the road.